Vivo V11 Pro mobile was released in Bangladesh in September 2018. It was one of the best smartphones in Vivo Bangladesh. Because of its internal features and configurations. The phone comes with a 6.41 inches Super AMOLED touch screen display. Its display resolution is 1080 pixels by 2340 pixels full view display. This smartphone has another lucrative thing is its teardrop display. Vivo V11 Pro price in Bangladesh is BDT 34,990. This smartphone has a great feature is the in-display fingerprint sensor. 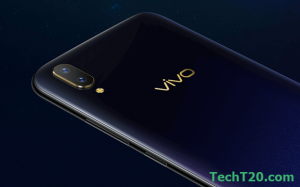 Vivo introduces it the first time in V11 Pro. It is a great achievement of vivo mobile phone. Vivo always try to give us the latest technology and great features on their smartphone. Vivo V11 Pro is powered by Octa-core processor with Qualcomm Snapdragon 660 chipset. Under the hood, the phone has 6GB of RAM and 128GB of internal storage that can be expanded up to 256GB via a microSD card. So you can play any games in your phone. Vivo V11 Pro has a great camera feature. It has 12MP primary and 5MP depth sensor dual rear camera and 25MP front-facing camera. That give you a perfect selfie or photos. Vivo V11 Pro is fully loaded by a non-removable 3400mAh battery life. So you use it full day without any worries. It is one of the bestselling smartphones of Vivo Bangladesh because of its lucrative design and features. Vivo V11 Pro is available on one color only in Bangladesh market and it is Starry Night. ~ 6.41 inch Super AMOLED Full HD Display. ~ 2.2 GHz Octa-core Kryo 260 Processor. ~ Dual 12MP+5MP(depth sensor) Rear & 25MP Front Camera. ~ 6 GB of RAM & 128 GB Internal Memory. 4x 1.84 GHz Kryo 260.